It's New year and to start it off on the best note possible, here are some tips for our traveler friends in Europe and especially those in Dublin. Jennifer P. (aka Dr. J) is an American expat living in Dublin, Ireland. She founded Sidewalk Safari, a travel-focused photo-blog in December 2008. Jennifer works full time as a project manager at Google by day and spends 1-2 weekends per month traveling around Europe. Over the past four years, she and husband Scott have taken 80 weekend breaks and bleisure trips around Europe. Given all this travel, Sidewalk Safari will celebrate it’s 2000th post in about a week. You can find Sidewalk Safari on Google+, Facebook, Twitter, and Pinterest. Having a full time job that you enjoy and loving to travel don’t have to be mutually exclusive pursuits. You just have to be smart about how you go about maximising your time on the road. 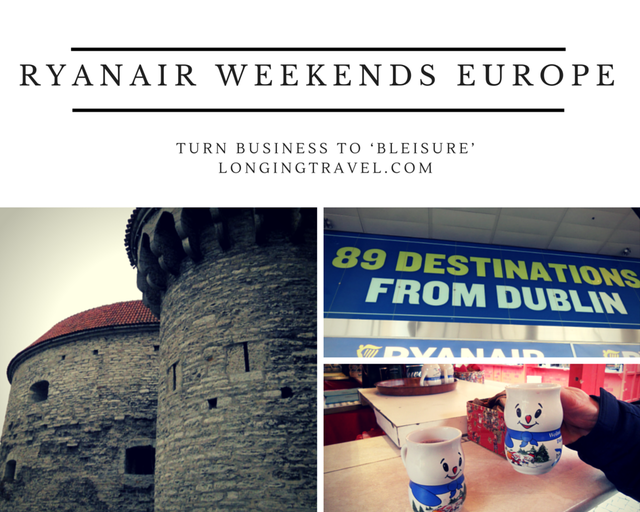 Tacking on a weekend to a business trip for a bit of ‘bleisure’ (business + leisure) fun is an easy way to make your time off go further and help the miles covered add up. I work a demanding full time job but I’m lucky enough to call Europe home and Dublin (where I live) is an ideal hub for taking weekend city breaks. Ryanair travels to 89 destinations (and growing!) from Dublin so we are spoiled for choice when we want to get away. 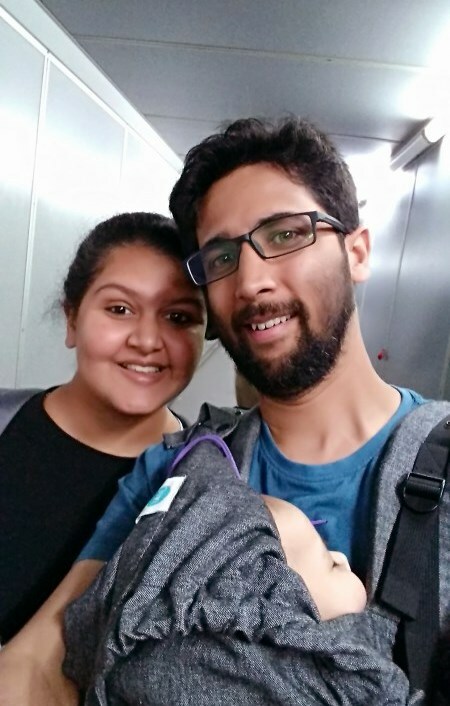 The distances are also much shorter in Europe than in the U.S. or India so it is very possible to leave for a ‘Ryanair Weekend’ early on Saturday morning and come back late on a Sunday night. You get nearly two full days to explore a new place without having to use a single vacation day. Splurge and throw in 1 vacation day and you have an enriching three day weekend. If you wrap the trip around a bank holiday, you can get a 4 day weekend for the cost of just a single vacation day. What if you don’t happen to live in Europe? I’m sure that many of you travel for your jobs. Perhaps you have occasional business trips that take you there? If that’s the case, it’s easy to research possible ‘Ryanair weekends’ in advance and add them on before or after your business trip. Cities like Dublin, London (Stansted and Gatwick), and Brussels (Charleroi) are low cost hubs for Ryanair. If your trip takes you to these locations, you’ve got it made. Most European markets of significant size have one or more low-fare airlines that can whisk you away for the weekend. Check out route maps (links for Ryanair and EasyJet) for inspiration. Click on any point on the map to see where you can get to from there. Rick Steves has published a table that includes some of the smaller players in the low fare game. You are also likely to find deals on major airlines on routes that compete with low-fare specialists so don’t overlook those options. Skyscanner is an absolute must if you are completely open-minded about where to go, especially if you are on a budget. Put the place where you’ll be traveling on business in the ‘From’ field and Everywhere in the ‘To’ field. Input the desired dates for your weekend getaway and off you go. Skyscanner returns a price ordered list of destinations for you to consider. You’ll see which countries are cheapest and then can dive in one level deeper to see the cost of destinations within that country. Skyscanner also offers an easy to use mobile app. There are some things you need to be aware of to ensure that your low-cost weekend getaway goes smoothly. The best deals on low-cost carriers are found by booking well in advance. The prices go up the closer you get to the departure date with no deals for last minute travel. On Ryanair, you are allowed one small carry-on bag. Until recently that was all that was included in the price of your ticket. Even your ‘personal item’ (e.g. a purse) needed to fit into your single bag. That rule has been relaxed a bit as Ryanair is trying to revamp their image to be more customer friendly but be cautious or you could end up spending upwards of 50 EUR on baggage fees. You have to pay to check any bags so if your business trip is a long one, it’s best to stash the large bag at the office or with a colleague staying behind and travel light. Find the Destination Airport on a Map. The airports that the low cost carriers fly to are often not the ones you typically associate with a city. For example, Ryanair flies to Beauvais Airport in ‘Paris’ which is actually an hour and fifteen minute bus ride from the city of Paris. Check the map and make sure you know where you’ll be landing. This is especially important if you are trying to time your return with a long haul flight home. Read carefully and follow every process exactly. You will not get an exception from Ryanair. Full stop. For example, all non-EU citizens need to stop by the Ryanair check-in desk for a ‘visa check’ stamp. It doesn't matter that you already printed out your boarding pass at home. Without that little stamp, you will be denied boarding. Oh, and you must print your boarding pass at home in advance. If you request one at the airport, it will cost you. Beware and you’ll be fine. We’re good about following rules and have never gotten ‘dinged’ by extra charges in 4+ years of traveling with Ryanair (touch wood). Here are some of my favorite weekend city break destinations in Europe that are a bit off the beaten track. I’ve chosen one for every season to hopefully give you some inspiration to super-charge your ‘bleisure’ trip. Clockwise from Top left: (a) ‘Fat Margaret’ in Tallinn Estonia (b) the pastel market square in Gdansk, Poland (c) Mugs of gluehwein at the German Christmas Markets in Cologne (d) Pintxos and Txakoli in Basque Country. You won’t spend time hunting endlessly for internet access. Estonia is one of the most connected cities on the planet where free wi-fi is ubiquitous in the city’s bars and cafes. Stroll past ‘Fat Margaret’, the iconic gate to the Medieval core and take a step back in time. Step outside the walls into the modern city and see concrete blocks to remind you of the communist era. You can even take a day trip by ferry to Helsinski, Finland from here if you are feeling ambitious (we were and we did). There is so much history in Gdansk. The first shots of World War II rang out here in Westerplatte and the city was the epicenter of the Solidarity workers movement led by Lech Wałęsa in the 1980s. The ‘historic’ core was mostly rebuilt in the image of the original after the war and is a lovely spot to enjoy a plate of pierogies (meat or cheese dumplings) that go down well with beer. From here, you can also take the tram and stroll the seaside boardwalk at Sopot. Basque country spans the northeast of Spain and the southwest of France and represents a proud and vibrant culture that transcends geo-political boundaries. Fantastic food and great beaches are the hallmark of the region. Try macarons made from a recipe created especially for King Louis XIV in the fishing village of St. Jean de Luz and gorge on tiny intricate pintxos served with effervescent wine in San Sebastian on the Spanish side of the border. The Christmas markets in Germany are a tradition that we revisit again and again each year. Some of our favorite markets are in Cologne. The largest is nestled in the shadow of the Dom (cathedral) but no fewer than six other outstanding markets dot the city. In a weekend, you can also easily access the markets at Dusseldorf and Bonn. I’m a collector by nature. You put down a deposit of a couple euro for the mug when you buy gluewein (hot mulled wine) but you can then take the mug home as a souvenir. We have mugs in all sorts of festive shapes ranging from boots, to snowmen, to beer barrels. We use them year round for our coffee and they always make me smile no matter what time of year it is. Check out additional recommendations form Dr. J here. Thanks for pulling together this series of weekend break ideas and for inviting me to contribute! I can't wait to see what else you have in store. We're always looking for ideas for trips that are big on fun but small on the need to use vacation days! 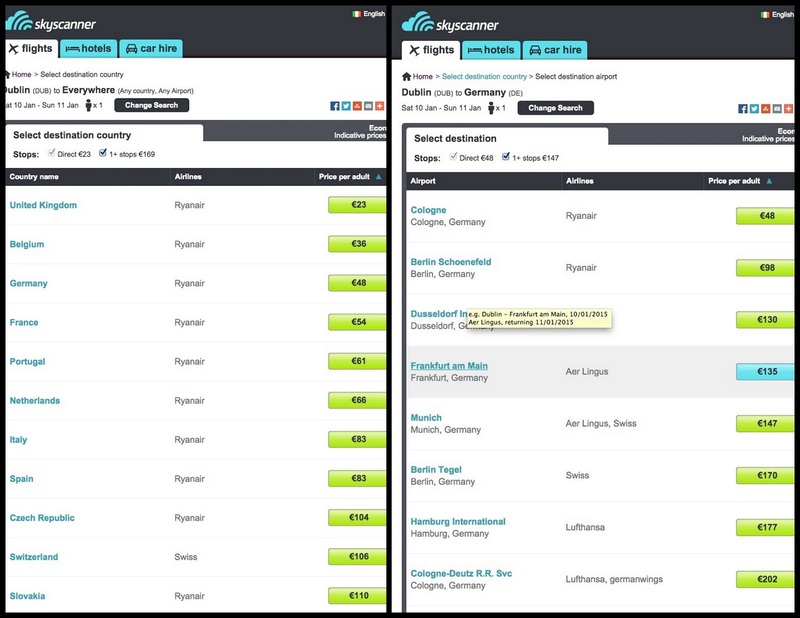 The search flights to "Everywhere" feature on Skyscanner is still mostly unknown as I mention it often to people searching for bargain airfares in Europe. I'm not sure why they don't promote it. If you are flexible and believe the every city is worth visiting, you'll find endless inspiration for weekend and longer city breaks across Europe. Plus when you search by Country you'll discover places you've probably never considered and sometimes never even heard of. Sidewalk Safari's example of Gdansk, Poland is an excellent suggestion of a place that is absolutely worth visiting but hardly is. You'll enjoy it even more when you have successfully booked a cheap flight well in advance from Dublin, or whatever low fare airline hub you call home. Two or three days is enough time to have a rewarding and memorable travel experience, plus you'll save precious vacation days with her tips. Same here we have ha so much fun and success searching everywhere and if you do not have any restriction their feature of searching whole year is something to look at. For those interested in reading more about 'bleisure' destinations for every season in Europe, I've posted a follow-up at Sidewalk Safari. Wroclaw, Poland; Valencia, Spain; and Edinburgh, Scotland are just three of my 12 picks for a year of weekend travel.